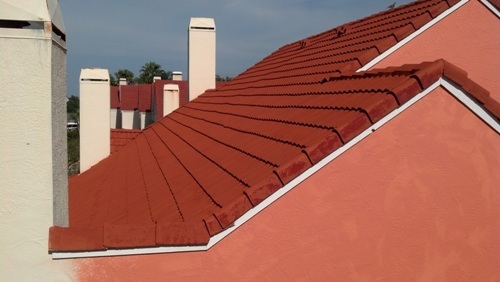 PEERLESS Painting Apollo Beach completed this large condo complex repaint and roof cleaning this summer. Our painters worked for three weeks solid avoiding the Apollo Beach rainstorms as best as we could. The condo’s were thoroughly pressure washed and prepared for painting in one week. First, all of the condo’s received a non pressure roof cleaning with the Peerless Punch System. 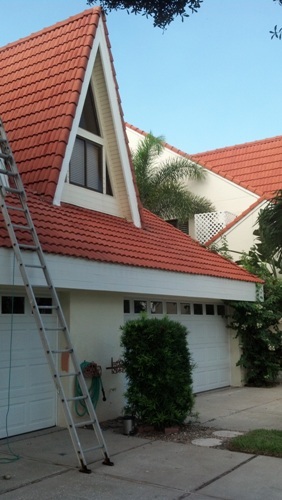 All of the tiles were sprayed with our gelled solution from our experienced roof cleaners. Following the roof cleaning, we then turned our commercial grade pressure washing trailer to the exterior surfaces. All of the exterior was down streamed with bleach and tri-sodium phosphate paint prep detergent. Then the pressure washers blast away the old flaking paint chips and oxidation. Our Apollo Beach Painters then pressure washed all of the driveways and sidewalks. Once all five condo’s were cleaned all lights and hardware were removed. Once the condo’s are good and dry we calked and patched all cracks. Then all of the areas not to be coated were taped with paper and plastic. This includes all of the windows, door hardware and over-spray areas. Loxon Conditioner Sealant by Sherwin Williams was applied to the entire building after the caulk was set. This clear coat bonds any old material to the substrate and seals all cracks and crevices. Two coats of Sherwin Williams Superpaint was applied and back-rolled by our painters. We utilize a commercial grade sprayer to move the pant to the walls. Then a large nap roller is used to move the paint into all of the textures. Painting Apollo Beach condo’s can require a lot of paint and materials. This job had well over 125 gallons of materials. Using quality paints such as Superpaint by Sherwin Williams with proper prep work ensure your will receive the longest lasting paint job. Contact Peerless for a free estimate for your home or business interior or exterior painting needs.